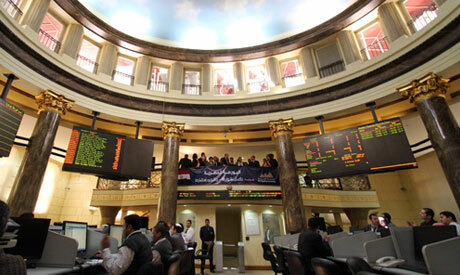 The Egyptian stock market suffered severe losses on Sunday amid a crunch in liquidity, just a few weeks before the Egyptian government implements its plan to offer shares of government companies on the capital market, with the psychological impact of traders negatively affected by a number of developments. Egypt's benchmark index (EGX30) fell 3.61 percent to reach 14755.63 points, its lowest level since February, while the EGX70 index fell 1.23 percent to stand at 733.61. "The sharp drop is due to what is happening in emerging markets and the exit of foreigners from them", said Radwa Suweifi, head of research at investment bank Pharos, in remarks to Reuters about Sunday's losses. She added that the "news of the confiscation of funds and business enterprises from Muslim Brotherhood leaders and the arrest of Alaa and Gamal Mubarak, in addition to the values of the dollar and the Egyptian pound, negatively affected the psyche of traders". Last week, Egypt seized the money and property of a number of Muslim Brotherhood leaders, whom the Egyptian government has considered a terrorist group since late 2013. Cairo's criminal court on Saturday ordered the arrest of Alaa and Gamal, the sons of former President Hosni Mubarak, in a case involving manipulating the Egyptian stock exchange. The market capitalization lost about EGP 24.56 billion of its value today, recording EGP 825.08 billion, compared to EGP 849.64 billion in Thursday’s session. "Today's session is the worst in terms of market losses since the pound floated in November 2016", Suweifi added. Citadel, Talaat Mostafa, Global Telecom, Palm Hills, and Hermes all fell by about 8 percent, and Pioneers fell around 7 percent. "There is a panic in the market amid tight liquidity", said Ibrahim Al-Nemer of Naeem Securities Brokerage. "Any attempts to rise without sufficient liquidity will be doomed to fail. What is happening in the market is not promising for next month's expected offerings," he added. Egypt's Minister of Finance Mohamed Mait had said earlier this month that the government is seeking to start the program of offerings in October to raise about EGP 25 billion from the sale of shares of four or five public companies on the stock exchange. The program aims to sell shares of dozens of its own companies over the next three to five years in sectors such as oil, services, chemicals, shipping, marine services and real estate to help support state's public finances. "Is there sufficient liquidity in the market to accommodate the expected offerings, whether governmental or private? We may see postponements of some of the offerings until the liquidity and psychological state of clients improve,” Suweifi said. *The numbers in the original article have been updated by Ahram Online according to the closing numbers of the Egyptian Exchange (EGX).